If you are a rental company purchasing equipment, then you know the value of getting a good return on your investment. For everything you spend on equipment, you want to make sure you are getting more in return, and you want to do that for as long as you can before the cost of maintenance and repair results in it no longer makes sense to rent them out. So what about concrete grinders? Should you purchase them? The answer… Of course. It doesn’t take a genius to figure out that a concrete grinder would be a must have in any rental fleet. Whether you rent or sell to the DYI-er at home, or the general contractor on the job-site, there is always a need for this equipment. But which one should you choose, and why? Below is a small checklist that covers some of the basics you should consider when purchasing a grinder for your company. You should always keep in mind when looking to purchase a new piece of equipment for your fleet, the number of potential rental opportunities you can expect to get for it in an average month. Knowing this approximate number will help you to determine how quickly you will see return on your investment. For example; let’s say that over the past couple months you have received approximately 2-4 inquiries a month about a type of small grinder that you don’t currently have in your fleet. 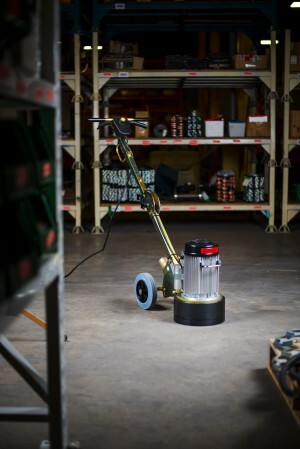 You ask around to your trusted customers and after doing some legitimate research, you decide that you want to purchase one of these small grinders for your rental fleet - knowing that you should be able to rent it out at least 2 times a month. Let's say the small grinder will cost you $1000 (or pounds etc. – the currency is irrelevant) and you can rent it out for $100 (for simplicity sake) a day. If the machine costs you $1000 to buy, you’ll want to divide your investment by the expected monthly income the machine will bring in and that totally will tell you how many months it will take before you get full return on your investment and can start making money on the machine. (1000 investment/ 200 dollars = 5 months) - this number doesn’t factor in the potential income you can bring in through consumables as well as maintenance costs but it will give you an idea of the potential ROI of a machine. One of the biggest concerns for renting out grinders is usability. Although grinders are not overly complex machines, there is always a risk for human error which can potentially result in a few different problems. A key factor in making a grinder purchase is how user-friendly it is. Is it a complicated machine? What are the power requirements? Does it require special training and knowledge? Does the design of the tool make it clear for the user on how to operate it? Is it intuitive? Is it clearly labeled on the machine? etc. By understanding the machine, and knowing what the potentially issues could be as a result of misuse, you can properly prepare and help to prevent possible issues by having all of the necessary precautions in place, if need be. Grinder power needs vary from one country to the next. Generally speaking, it is believed that Electric grinders provide more torque over propane grinders. Propane grinders don’t have any cord attachments and are easy to use without requiring plugs or special power hookups, but in many cases propane grinders are restricted from use on certain job sites, or could be hazardous if operated in a poorly ventilated space. Electric grinders are the most common, but they can differ in power requirements. Depending on where you’re located in the world, you could be dealing with machines that are 110v, 120v, 220v, 230v, and 240v for small grinders. You’ll want to ensure that the equipment you invest in has the appropriate electrical need for your target market. Again, amperage is the next factor to consider as not all power sources are the same especially as they vary from Canadian, North American, UK, and European manufacturers. A frequent problem with higher amperage grinders is breaker tripping, which can be an issue for the worker and the machine. Making sure that the grinder is clearly and properly labeled, will help to prevent the breaker from tripping. Another major factor in selecting the right concrete grinder for your rental company depends on the weight of the machine. 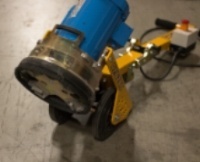 Grinders that are used for prepping concrete floors or to remove coatings applied to concrete floors are often heavier. The weight and power needs are greatly increased to provide more down-pressure, torque and power which results in the necessary aggressive grinding that is required for removal. Heavier weighted grinders become more of an issue for operation if not designed properly. Some machines can wear on the operator when using if they aren’t designed with the operator in mind, causing quicker operator fatigue. Select a machine that has the weight, but is designed to reduce operator fatigue. Another factor with weight is transportation and maneuverability. Heavier grinders need trailer transportation with reinforced flooring. Also, heavier grinders need to be transported in elevators when working on various floors throughout a building. You also need to consider that with larger, heavier grinders the size of the unit is often greatly increased, so maneuverability through doorways and tight spaces should also be considered. Remember to match the grinder with your marketplace and choose a unit that offers the most flexibility without compromising the power of the machine that is needed for the most common projects it is used for. Storing grinders is not usually an issue when dealing with smaller grinders, but when you move into larger type units they often take up more floor space in your machine rental area. Additionally, often these units are too heavy to stack on racking unless you have industrial racking installed, and lift equipment to raise the machines up and down onto the shelving. Another factor to consider when storing is the need for attachment units, like a vacuum. Concrete grinders need a dust extractor system which you’ll need to take into consideration when storing - but this offers more opportunity for up-selling; so having this type of extra equipment to store isn’t necessarily a bad thing. You can attach the tooling and rent it with the machine as a unit. You can ‘sell’ the tooling to the customer as a consumable based on their needs. Selling the tooling as a consumable is often what most rental companies choose because it allows you to make extra revenue, and removes the potential of excessive lost-revenue due to customers over-using or misusing the tooling. Another consideration for tooling is to be aware that not all tooling is universal, especially when considering larger grinders. Often manufacturers have unique tooling systems for the attachment of their tooling to their specific grinder. Which means that you are often limited where you can purchase future tooling from. Most of these restrictions can be easily overcome with adapter plates that allow the use of a wider range of tooling. The cost for adapter plates would then be factored into your equipment cost, so you’re not absorbing it and taking away from your revenue. Choosing a concrete grinder for your rental fleet is probably a foregone conclusion as they are frequently rented item in many rental locations. Taking some time to understand your market and deciding what the best sales and rental structure is for your company, as well as keeping in mind the variable considerations you need to be aware of when making your purchase, will make a huge difference in your ROI potential. If you follow this easy checklist, you should have no issues finding the right grinder for rental fleet.